He was born in Savantwadi, then a State in Bombay Presidency. He lost his father when he was only three years old. 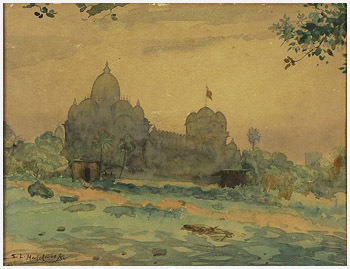 1908 He started the Haldankars Fine Art Institute, Bombay. 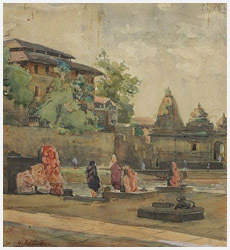 In 1918, with the co-operation of other artist friends, he established the Art Society of India. He remained the President of the Art Society for many years took active interest in its affairs. During his professional career Haldankar had gained the highest reputation. He was commissioned to paint portraits of the late Pandit Madan Malaviya, Jagannath Sunkersett, Sir John Beaumont, Lady and Sir Leslie Wilson and the Raja Saheb of Sawantwadi to mention a few. Haldankar had associated himself with many art activities and had been a member of different important committees and societies. He was the President of the Maharashtra Chitrakar Mandal. He was the member of the Hansa Mehta Committee for Re-organisation of Art Education. His soft manners and firm convictions based on his wide. He studied up to Matriculation at Sawantwadi. Haldankar passed the two grade Examination under the guidance of an expert art teacher, N. S. Malankar. 1903 Joined the J.J. School of Art and was trained under teachers like Cecil L. Burns, Walter Robotham, Ganpatrao Kedari, A.K. Trinidade, S.P. Agaskar and M.V. Dhurandhar. 1914 Exhb., Royal British Society of Arts. Held numerous exhb. in Mumbai, Chennai and Simla. Academy of Art, Moscow, USSR. During his years at the J.J. School of Art, he had a brilliant career and listed himself at the top and winning almost all the prizes. Won two commendation certificates from the Royal British Society of Art. In the years 1910, 1927 and 1932 S.L. Haldankar won the Governors Prize. 1964 Called to New Delhi for the felicitation by the Rastrapati, Dr Rajendra Prasad. 1965 Fecilitated as a fellow, Lalit Kala Akademi, New Delhi. Haldankar taught at the J.J. School of Art, Bombay. Taught at the Haldandkar`s Fine Art Institute, Bombay.